This blog started as a way of documenting our journey towards creating more of the life we wanted to be living. 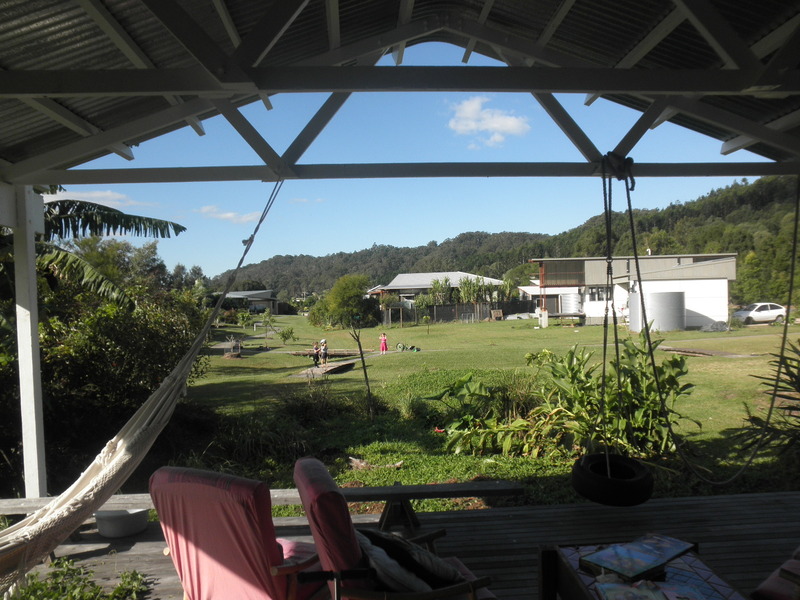 Buying land and building a home here in the Ecovillage (in Currumbin Valley) was the first really big step. It was a massive leap of faith as we had almost no savings and hence had to buy and build on 100% finance. It’s hard paying a huge mortgage and it means we both have to work full-time but everything that we envisaged about living here and raising our children here has come about. We live in a community of like-minded people. Of course, people have their differences. There are politics and disagreements but on the whole, it’s a harmonious and supportive community. I love the fact that I know most people here, that we wave at each other as we pass and that there is always someone to offer help, assistance or advice when I ask for it (over our community email hub). We have no fences here. The children and kangaroos roam freely. Our children have more than just the two of us to parent and guide them. Some weekends we may end up with a whole gaggle of village kids at our house. Other weekends we may not see our kids all day as they spend the day at another village house or riding and playing outside on our greenways. 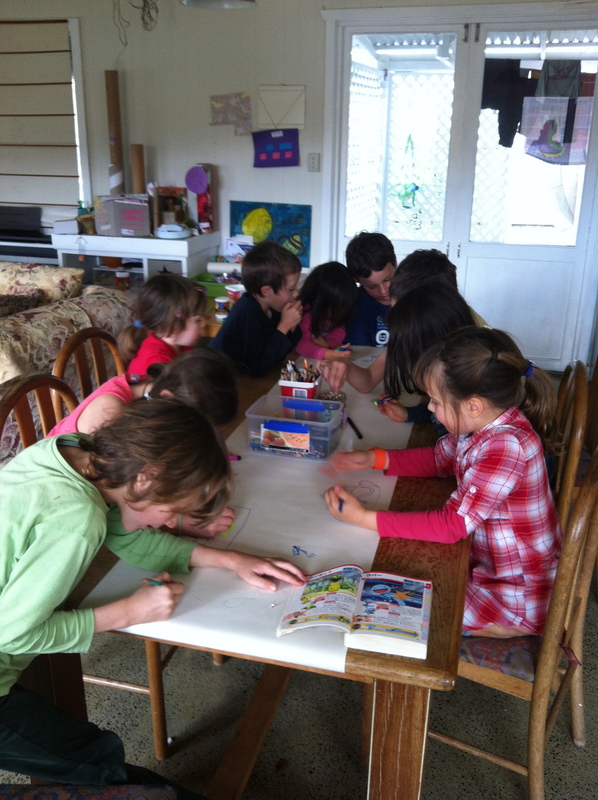 We don’t have to arrange playdates – the kids find each other and play happens spontaneously and organically. 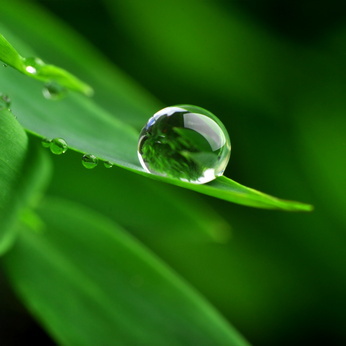 Living here in the Ecovillage makes green living easier. We thought about rural living or acreage but I felt so daunted by the idea of having to work out all the solar and water stuff that we knew nothing about. Here, it was already worked out in a detailed building code. We have solar-generated power (grid connected), 100% rainwater (ah the bliss of rainwater baths and showers – something I always dreamed of), a community waste-water treatment plant and recycled water that we can use on our gardens. I’ve always been “green” but it was a dream, an ideal – something I didn’t feel able to really apply to my life except through avoiding chemicals and processed foods. We wanted to live with a rural feel but we didn’t want to be isolated. Friends warned us that with acreage we would spend our days on ride-on mowers and weekends would be filled with the sound of slashers and mowers. That wasn’t the life for us but neither was suburbia. Here, we live on just over 1/4 acre but we have shared greenways between the houses and very little fencing so it feels like we have more land than we do. This really feels like home. I’m where I want to be. I can see myself getting old here, having grandchildren visit me here. And if I don’t have grandkids of my own, I’ll adopt my neighbour’s grandkids. I’ve never lived anywhere else that I felt I could stay forever but I have that feeling here and it’s a good feeling. In just one short moment, your life can change forever. Last week I had a car accident. Luckily, I survived. Thankfully, noone else was in the car with me and there were no other cars or people involved. I was hurt but not badly. It could have been worse. The car was not so lucky and “Rosie” was sent off to car heaven. Recently I read that in a car accident, you are pulled instantly into the present moment: out of your musings on the past and dreamings of the future into a true present. And that is exactly what I experienced. “Did you have lots of memories flashing past you?”, a friend asked me yesterday. No. There was only the present moment. I did not think of my children. I did not think of my husband. I was there, right there in what was happening as my car planed on a wet and oily road to the wrong side of the road and back again and finally smashed into a rock wall. I was thrown around like a rag doll, badly bruised and it feels like all the muscles in my upper body and neck have been pulled and stretched. Now I know why I’ve never liked roller coaster rides and scary theme park rides – they are a toned down version of my accident. Not my idea of fun. So why did it happen? I may not ever know and the relief of this experience has been letting go of trying to analyse and see a message in it. It’s about sitting in what is, experiencing what is. Right here. Right now. Today, my thoughts were constantly on the tragedy and loss that Lauren and her family of the blog “Sparkling Adventures” have experienced. In one moment, her life has changed forever. My heart aches for you Lauren. I only discovered your blog a few weeks ago and it was such a shock when I heard yesterday, via an unschooling friend, of the loss of your baby son and the events surrounding his death. In light of this, my car accident is so insignificant. A grain of sand, less even. But it could have been such a different outcome. Today, Kayo climbed up on a wall on the 2nd floor of a high school balcony. Kosuke noticed her and yanked her down in fear and shock. One slip and she would have fallen to her death or at least severe injury onto the ashphalt below. One moment, a different outcome. So, the day closes with a feeling of gratitude. Gratitude for the blessings I have experienced in my life and for the protection and luck thus far. Life is tenuous and it could change in a moment so all we can do is hold on for the ride and treasure this moment. Right here. Right now. 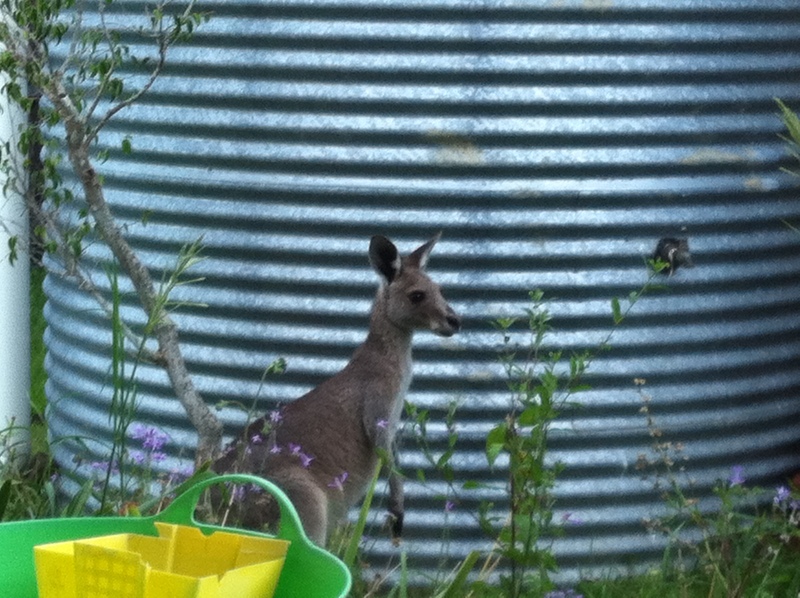 Today, as I watched some kangaroos hop slowly through our garden as though it was their own (and it is really), I suddenly remembered visiting friends on Molloy Island in south Western Australia nearly 20 years ago and being so impressed by the kangaroos hopping between the houses and the policy of no fences. We tried to buy land on Molloy Island but the bank wouldn’t lend us the money because we were working in Japan and insisted we had to have a guarantor. We gave up on this idea but clearly the idea of living an eco-life must have planted the seeds for the life we live now. The month of May is my favourite time of year – glorious sunny days that are not too hot, nice cool nights that are cool enough for snuggling under a doona; crisp and clear, sunshine and freshness. It’s also the month when I’m really aware of winter being just around the corner and I make a concerted effort to soak up the sun and get the kids outdoors as much as possible. One of the best things about where we live is what is called the “greenway” behind our house. We live in an ecovillage where the houses are built in clusters called hamlets all looking in on a central greenway. 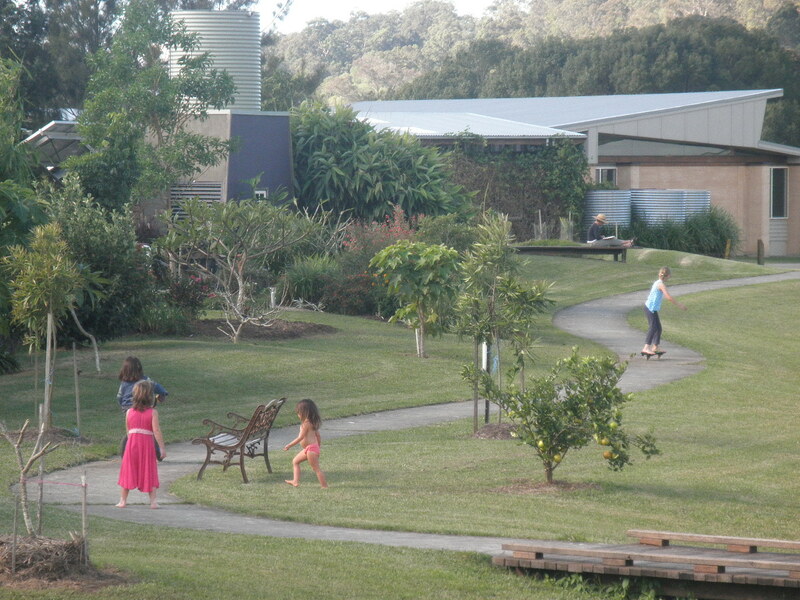 There is a pathway running through and the kids can play freely without worrying about cars and without being fenced in. And I can watch from inside where generally I’m cooking in the kitchen or working on my laptop at the dining table. And now, in June, winter has well and truly arrived. Everyone’s talking about how cold it is. “Bleak” was the word my mother used today. In reality, it’s only around 18 degrees – not that cold! But in a sub-tropical climate like this, mild cold feels colder than it really is. Here in the valley it can get down to almost zero and we do get the odd frost. So nice to have the contrast to the hot, humid summers but at the beginning of winter, it feels like a long time until it’s beach and sundresses time again. 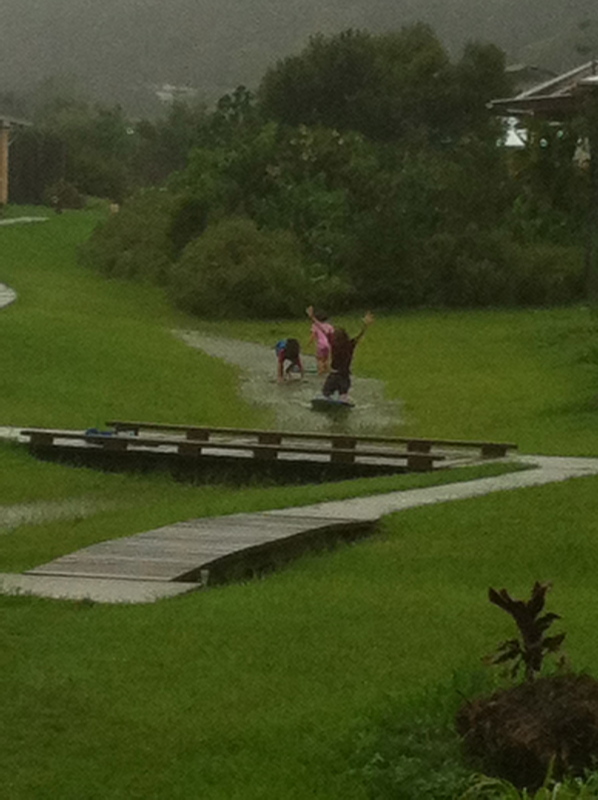 The recent floods in Queensland were a very sobering reminder of how life can change in a matter of minutes. My heart really goes out to the people affected by the floods, in particular to those who have lost loved ones. The impacts of this natural disaster will continue to be felt for a very long time. When we first started hearing that the floods were headed for Brisbane, I was worried that the Gold Coast would be next. I rang my husband and asked him to gather our important documents like passports (forgetting insurance papers!) and discs of photos from our computer. I tried to think of what we really didn’t want to lose in the flood. Apart from our house itself, I couldn’t really think of anything. Of course it would be devastating to have your life’s possessions washed away but I realised that really all that mattered was our own safety. As long as we (especially our children) were ok and together, we would be alright, we would get through. Later, I saw footage of a family on the top floor of their home as they filmed the rising flood outside and watched their possessions floating away. The woman called out despairingly as her lounge suite was carried away by the flood: “my lounge! my lounge!” And in that moment, I suddenly didn’t mind my shabby old hand-me-down lounge anymore. The flood has cured me of any desire to have expensive furniture. My thoughts turned to people who have spent years building up beautiful collections of antique furniture. I wonder if they lost most of it or if it was damaged beyond repair. An expensive new lounge is replaceable – especially if it’s insured – but antiques aren’t. I’ve always loved antiques but now I’m content to admire them in other people’s homes! I think I’d rather concentrate on paying off my mortgage sooner and not worrying when my kids are bouncing all over the sofa and doing somersaults (“look at me mama, look at me!”) or my friend’s toddler scribbles all over the back of the lounge (scallywag but much loved!!). 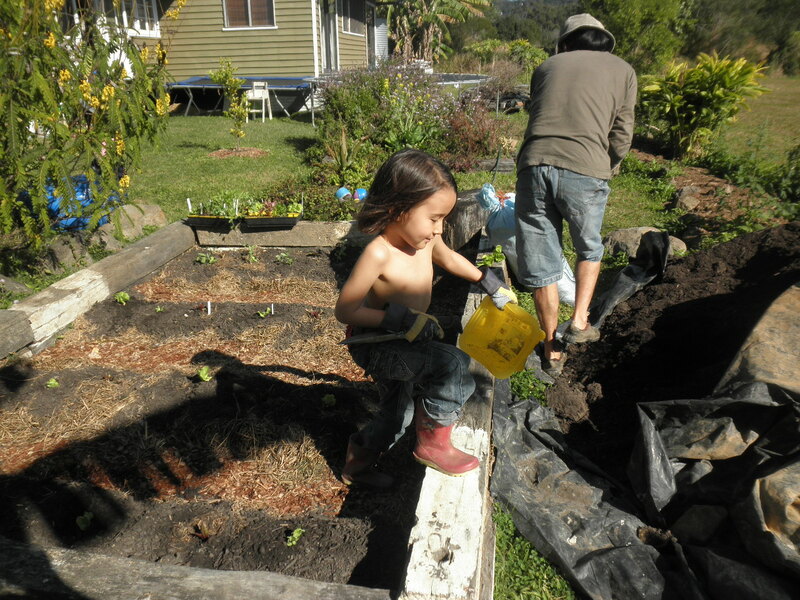 I feel a new appreciation for my family life and the life that we are creating for ourselves here in the ecovillage. I’m told that this area would not experience the kind of flooding that occurred in Brisbane, the Lockyer Valley, Toowoomba and so on. I hope not, but it has been good for me to get a bit of perspective on what’s really important. Family time has taken on new meaning and significance for us. It is unspoken but I can sense that both my husband and I are treasuring time together and as a family more than before the floods. And as for shabby, there’s always recovering. 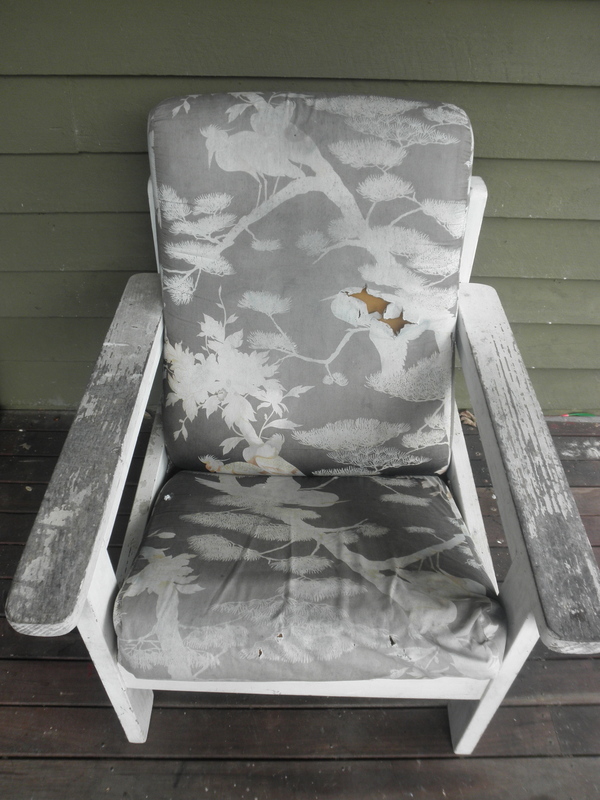 We picked these two chairs up from the side of the road some years ago. 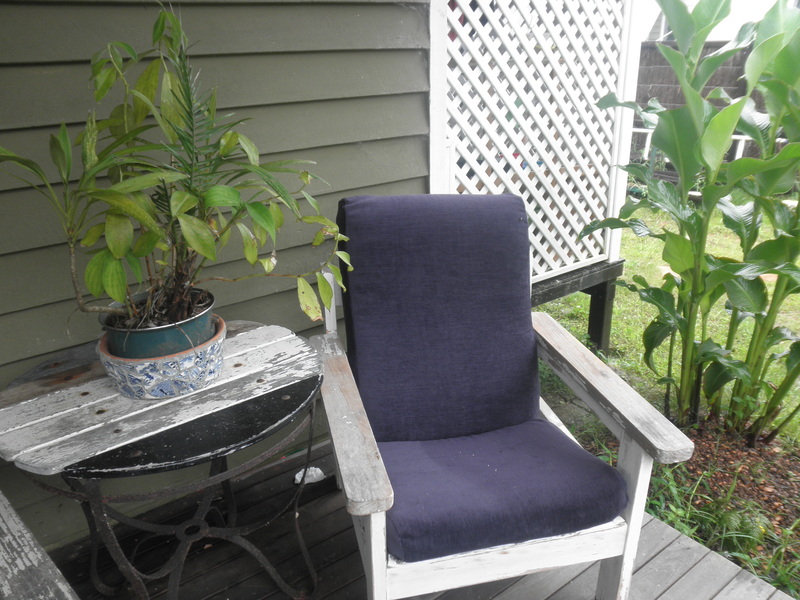 This summer, I recovered them and our front deck now feels so different with my “brand new” deck chairs!